For those of you who have not yet visited the hilarious (and very R rated) Why Women Hate Men blog, it showcases men who have managed to make the worst possible impression in their personal ads on the Web. Like these unfortunate souls, many horsepeople seem to put zero thought and effort into the way they are presenting themselves and their horses on the web...and the result makes for a lot of Fugly fodder! Click on this ad to see a larger version. Boy, there's nothing to support a motto like "breed to the best - don't settle for less" like a couple of crappy pictures of your mud-covered young stallion in his pen with his wiener hanging all the way out. (I guess that was for the slow folks, to show what a REAL MAN he is.) 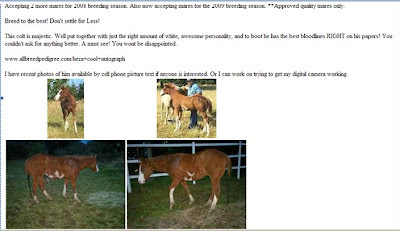 This colt actually is well bred and there is a BETTER, recent picture of him on their web site. They are doing him a huge disservice by putting up the muddy pasture yak pictures. Also, he is two years old and they need to stop breeding him until he actually accomplishes something, and by the way, given that he's a Sir Cool Skip grandson, I'd like to know his HYPP status, wouldn't you? Stop worrying about the pearl gene and start worrying about whether his foals are going to fall over dead, would you please? Let's move on to facilities. You know, while all of us would like the idyllic white board fenced establishment of our teenage dreams, those don't come cheap. I understand that many of us end up acquiring fixer-upper properties, upon which the former owners left their collection of junker cars, piles of trash, etc. and it takes time and money to finish the clean-up. But for heaven's sake, PICK YOUR BACKGROUND when you are shooting pics to go on the web! Lead the horse over to where there are only trees behind it, no barbed wire, no vehicles, no farm equipment...and take your picture there! But no, invariably people pick the worst possible backdrop for their horse pictures. Their horses look like they are living on the set of Sanford & Son! This very special picture is from Mustang Hearts, which pretty much everybody and their grandma knows by now is a wacko hoarder, not a rescue. But assuming you are still trying to pretend you are a rescue, Debbie, don't you think you could have come up with better pictures than these? Surely there is SOME PLACE on your property (wherever it is you live now that you've been evicted) that looks reasonably clean? Nice fenceline. Nice unbelievable amount of crap in with the horses. WTF is that horse eating out of, a dog dish? A flowerpot? Finally, just like with personal ads, it's not a good idea to describe yourself as a 10 when you're maybe a 2.5 (in low light, at bar time). 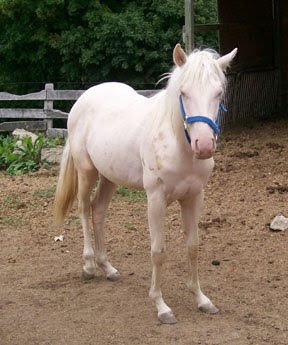 This colt is described as one that would "make a nice breeding stallion for someone." That is like saying that Jessica Simpson might cure cancer! Rarely have I seen such an astounding set of long, weak, crooked, fucked up pasterns. The fact that he's shaggy, dotted with manure stains, desperately needs his feet trimmed and photographed haphazardly in a grazed-down dirt pen with weeds, chewed on fence and an impressive collection of manure only adds to the impression that this little guy is going to be damn lucky if he hits age two without winding up as a sandwich. If you put it on the web, it's going to be judged. I admit that one day, in an impulsive moment, I got on a rescue horse wearing a most unflattering pair of cropped sweat pants and now there are pictures of me, on the web, suffering from a bad case of VPL and looking like I had gained 20 pounds. Fortunately, I'm not for sale! 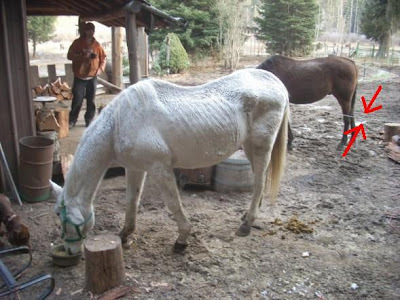 (Well, maybe to the right bidder...applicants possessing 40+ acres, a newer dually and an aluminum gooseneck 6 horse or better are welcome to apply...LOL) But seriously, whether you're trying to sell a horse, stand a stallion at stud, or convince donors you're a reputable rescue, appearance matters. Put a little effort into how you present yourself on the web and you won't check this blog one day to find yourself on it!